White Sands Beach is typically deserted. Not a nice beach to swim at, this beach is however decent for beach combing and at times is a viable kiteboarding spot. The coast here tends to have a bit more seaweed than at the island's other beaches. 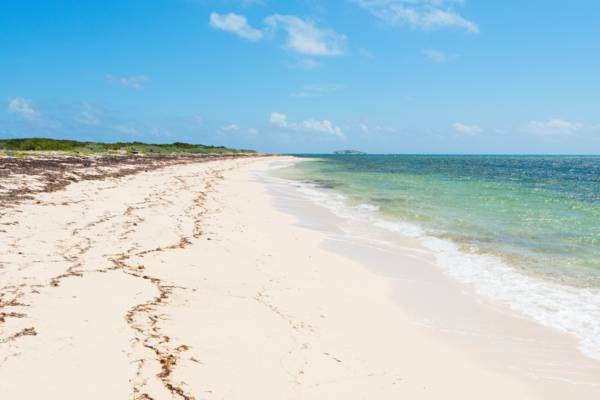 White Sands Beach is a secluded 1.5 mile (2.4km) stretch of coast on the southeast of Grand Turk. The water here is very shallow with large amounts of seaweed, so it’s a poor location for swimming or snorkelling. For cruise ship visitors looking to explore on their own, it’s a one to two mile (1.5-3km) walk down the beach from the Grand Turk Cruise Center. For those vacationing on Grand Turk on a cruise ship stop over or a day trip from Providenciales, exploring the island’s sights and attractions by rental car is our top recommend activity. The undeveloped coasts, bluffs and salinas near White Sands Beach is a great place to discover. The adjacent Hawkes Nest Salina typically collects the greatest amount of crystallised salt of any of the disused salinas in the country, and can be a reflective sea of white at times. To the north of White Sands Beach are the wetlands of South Creek, inland red mangrove-lined waterways that shelter birdlife. To the south is Boaby Rock Point Beach, which hides the island’s finest shore snorkelling site. Scarcely anything remains of the historical site today, but the low bluff of Gun Hill on the northern end of this beach was once home to a small British cannon battery. This late 1700s or early 1800s light fortification was probably built in response to possible threats from France and the Haitian revolution. Record-keeping on such matters unfortunately haven’t been thorough in the past, however, several of the cannons on public display on Grand Turk likely came from this site, as well as the previous site of Colonel Murray’s Fort to the north. This beach is more difficult to access than most of the other beaches on Grand Turk. A poor condition track does lead to White Sands beach along Hawkes Nest Salina, but for most the easiest way to get here is to walk up the coast northeast from Boaby Rock Point.